Type locality: 10 km west of Quilmes, Tucuman, 3500 metres above sea level. Habitat and Ecology: The species grows in monte shrubland and prepuna, in rocky soil. The only threat is local collection for ornamental use. 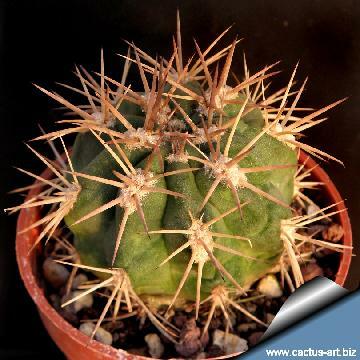 Description: Acanthocalycium ferrarii is a solitary very spiny globular cactus that produces flowers that can be orange, red or yellow. It is rather rare in collections. The taxon name comes from Greek akantha (meaning prickly) and kalyx (meaning buds), which refers to the spines on the floral tubes. Stem: Up to 12 cm in diameter, globular to somewhat depressed-spherical (often more cylindrical in cultivation), usually unbranched, green or greyish-green. Ribs: Up to 18, rounded, enlarged at areoles. Radial spines: Typically 9, up to 2 cm long in four pairs spreading laterally with an odd one pointing downward (but sometime with 1 to 3 small additional spines on the upper part of the areole) creamy-white, horn coloured or yellowish often with brownish-red tips. Central spines: 1 to 4 strong, usually straight, subulate, up to 1,5 cm long, of the same colour of radials. Flowers: 5,5 cm long, 5 cm in diameter, carmine red, orange or yellow. Fruits: Oval, to 10 mm long and 8 mm broad. Note: Acanthocalycium ferrarii is similar to Acanthoclycium thionanthum, but its stems are less grey, more flattened and never cylindrical (in habitat), moreover it lives at lower elevation in a different climate. 3) David Hunt, Nigel Taylor “The New Cactus Lexicon” DH Books. 4) Demaio, P., Lowry, M., Ortega-Baes, P., Perea, M. & Trevisson, M. 2013. Echinopsis thionantha. The IUCN Red List of Threatened Species. Version 2014.3. <www.iucnredlist.org>. Downloaded on 26 April 2015. 5) Wikipedia contributors. 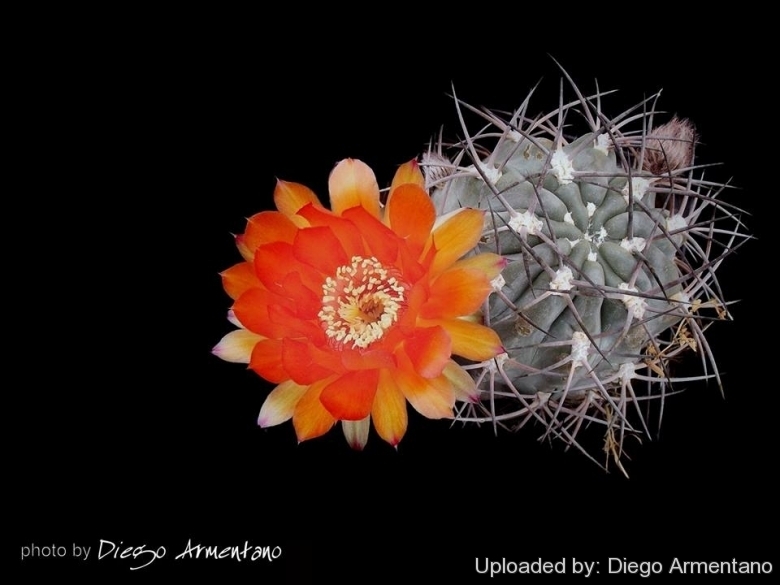 "Acanthocalycium." Wikipedia, The Free Encyclopedia. Wikipedia, The Free Encyclopedia, 18 Feb. 2014. Web. 26 Apr. 2015. 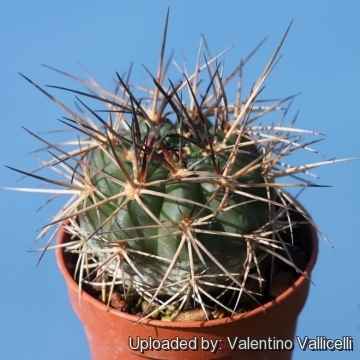 Cultivation and Propagation: Acanthocalicium ferrarii is an easy to grow succulent, more cold tolerant than most and less fussy regarding soil conditions. Growth rate: It is a relatively rapidly growing and easily flowering species. Watering: Water regularly in summer, but do not overwater (Rot prone), keep dry in winter. Hardiness: Reputedly somewhat resistant to frost if kept on the dry side prior to, and during, cold weather (hardy to -12 C ° C, or less for short periods). Exposition: Outside bright but filtered sunlight or afternoon shade, inside it needs bright light, and some direct sun. Tends to bronze in strong light, which encourages flowering and heavy spine production. - Red spiders: It is susceptible to spider mites, so it should be check once in a while for it. Overhead watering is helpful in controlling mites. Propagation: Direct sow after last frost. Seeds germinate in 7-14 days at 21-27° C in spring, remove gradually the glass cover as soon the plants will be well rooted (ca 1-2 weeks) and keep ventilated, no full sun for young plants!